From the steam-powered Hook Norton Brewery in Oxfordshire comes Twelve Days. At 5.5% alcohol this is a relatively weak English Christmas ale. 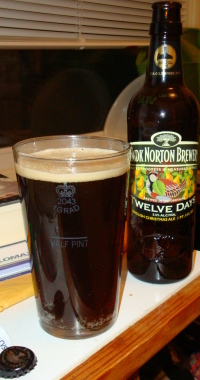 Twelve Days pours a dark ruddy brown. The head is a creamy tan, but the low level of carbonation makes it timid. A stale cidery aroma is all I can smell, almost like an old barrel. The flavor is somewhat sweet and significantly cidery as well. A bit of caramel malt comes through, and a hint of hops. This beer doesn’t seem like it travelled very well. This entry was posted on Monday, December 29th, 2008 at 1:30	and is filed under English Ale. You can follow any responses to this entry through the RSS 2.0 feed. You can leave a response, or trackback from your own site.